The most common light fitting in Victorian homes was the oil lamp. They were originally very simple objects with a simple wick protruding from a small container of oil. 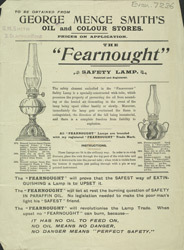 As the century developed much brighter and more sophisticated lamps emerged, like the ‘Fearnought’ oil lamp advertised on this leaflet. Fire was a serious hazard during this period and it was important that risks be kept to a minimum, this product is a ‘safety lamp’ and would have been very popular.